Watching the Hall of Fame induction ceremony this past weekend, I was struck with a true feeling of nostalgia. I don't lend myself to feeling nostalgic, almost by rule. But seeing Brian Urlacher, whose striking physicality in a Maxim magazine NFL preview edition photo - then realizing the ginormous, cheetah-fast middle linebacker avatar in Madden 2002 was the same person - made me start watching the Chicago Bears play. To my dismay, littered among the wonderful pieces about Urlacher's career were stories contrasting Urlacher's Hall of Fame character to Chicago Bears rookie holdout Roquan Smith. It's a pity some people are losing their perspective more quickly than an 80-year taking off their bifocals. Somehow, according to the train of thought, getting to camp on time supercharged Urlacher to the Hall of Fame. Paradoxically, Smith, apparently, is never going to reach the Hall of Fame because he decided to hold out as a rookie. The wolves have come out for Smith since the Bears first pre-season game wrapped up last Thursday. It's become a semi-annual tradition for grown men with no hobbies to go after a young 20-something who had the gaul to stand up for his worth. It's a shame that we often ignore how the NFL is the complete opposite of a democracy or a capitalist free market, something a large contingent of NFL fans loudly support. Every year, the most talented athletes coming out of college aren't allowed to exercise the same same right as anyone looking for an employer: the right to sell their services to the best company or highest bidder. No, the best NFL rookies are forced to go to a team with a proven ability to fail. Then we, the loyal fans emboldening these dysfunctional franchises, criticize that the player chooses to fight to ensure the word 'guaranteed' meets its dictionary definition. Lost in this is the fact that it takes two to tango. One person may sign a contract, but it's the team that can offer a contract worth signing. I am totally onside with Roquan Smith in this. I’ve watched the Bears be awful for five years by doing things like this - by being conservative, small-minded, and 'principled'. We hire old-school types like Phil Emery (who think Shea McClellin’s are elite prospects because he had a great work ethic), John Fox (who thinks a pass is something you use to enter to an amusement park), and Ted Phillips (who, as as Team President and lead negotiator, has overseen five rookie holdouts since the mid-90's - yes, five). This is a team who held onto Jay Cutler for five seasons too long, thus ensuring mediocrity would last until, hopefully, now. This is a team that won’t even change the grass field to turf. It all comes back to ownership. The McCaskey family is far too engrained in the old guard NFL ownership cadre. They lack imagination and are scared of their own shadow. George McCaskey’s already came out in support of the anthem policy, which is just the worst. Like so many old, white, ensconced blue bloods that make up the NFL's ownership group, the McCaskey's hide behind protecting the logo on the helmet and the GSH on the sleeve. In their minds, actually practicing guarantees to a top-10 pick will destroy that and bring down the league (whispers are this is precisely why the Bears are standing firm – because they think this is a league-wide precedent and it’s their responsibility to set it). Watching Urlacher speak on Saturday as he went into the Hall of Fame made me realize why I watched the Bears in the first place: the players. Urlacher was the reason I became a Bears fan. The Devin Hester’s, Charles Tillman’s, Tommie Harris’, and Matt Forte’s are why I care about the Bears. Not the McCaskey’s or Ted Phillip’s. The logo on the helmet is made great by the players who wear it – not the owners who choose to step on players heads to increase the value of that logo and draw greater revenue’s even while mediocre. Losing begins with the players. Sustained losing is placed at the feet of coaches. Years of losing is with the Front Office. But decades of mediocrity? We consistently fail as fans to appropriately place accountability. It’s too big of a picture. It takes attention-grabbing, egomaniacal owners like Al Davis and Jerry Jones to pull the cameras onto themselves to show us who is most responsible for whether our NFL team works. And guess what? It took Davis dying and Jerry handing the reigns to his son before those teams become consistent again. 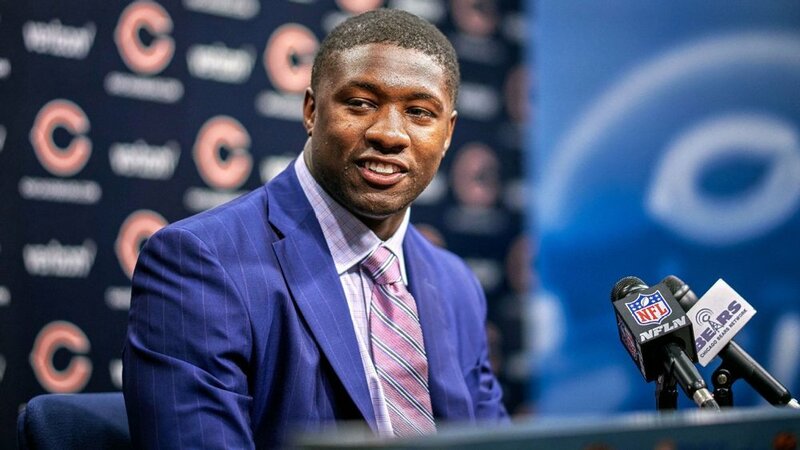 If it takes someone like Roquan Smith every once and a while to reveal to fans (those who want to pay attention) that our ownership groups can’t change and that’s why we are losers, so be it. I'd rather cheer for a person fighting for themselves than a family screwing over an entire city.